Thailand's famous beach resort town of Pattaya has developed a colorful reputation over the years. Located less than 200 kilometers from Thailand's capital city of Bangkok, it's a convenient place to enjoy the sun, sand, and sea. Pattaya has drawn tourists and expats from all over the world ever since US soldiers "discovered" the once-sleepy getaway destination during the Vietnam War. 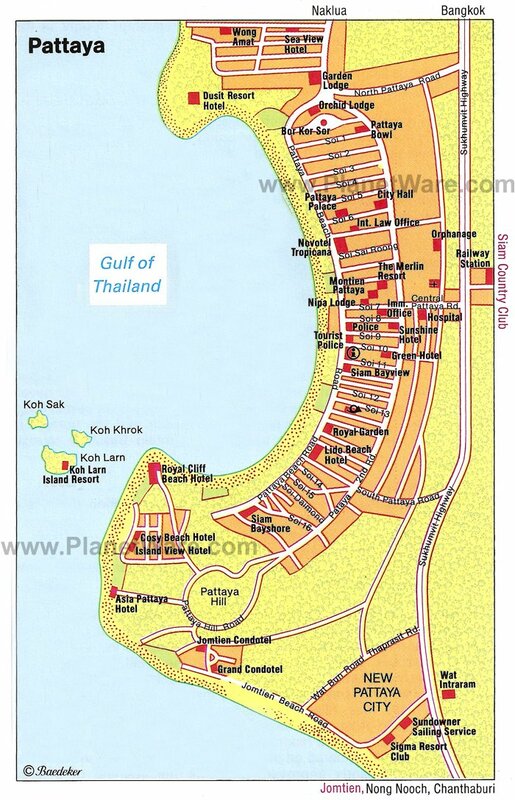 Since then, Pattaya's profile has steadily increased, and it is now one of the most popular beach destinations in Southeast Asia. 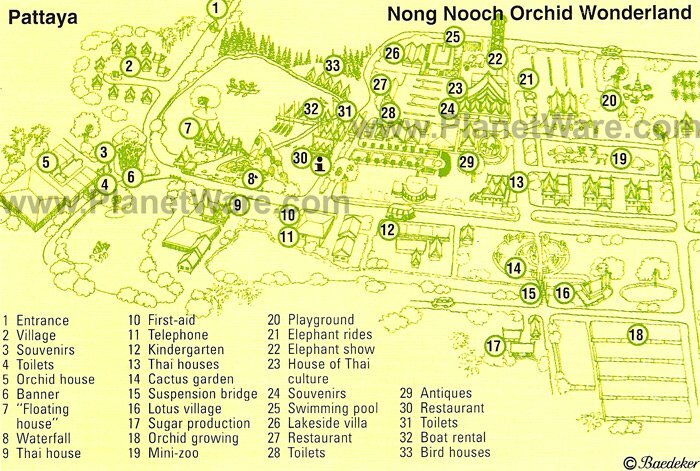 The sprawling park at Nong Nooch (pronounced "nung nut") Village offers a variety of activities for all the family. Walkways wind among colorful themed gardens, including a topiary garden; 17th-century French garden; European Renaissance garden; and species-specific gardens featuring plants like tropical palms, succulents, and bonsai. The magnificent orchid garden will awaken the inner horticulturist in anyone. Live shows at the Thai Cultural Hall add to the line-up with performances of traditional Thai dancing, sword-fighting, Thai kickboxing, and an elephant show of dubious ethical quality. You can rent a bicycle to explore the different areas of the park, and door-to-door transportation is available. Better still, sign up for the Nong Nooch Village Half-Day Tour from Pattaya. This four-hour excursion includes a guided tour of the gardens, round-trip transport from Pattaya, and convenient hotel pickup and drop-off. Stretching for six kilometers, Jomtien Beach is a welcome escape from the bustle of the main city four kilometers away. You can sunbathe along its golden shores or take refuge in shade provided by trees at the beach's edge. Water lovers can enjoy all kinds of activities, including jet-skiing, kitesurfing, parasailing, and windsurfing. When you need refreshment, you'll find plenty of restaurants and cafes along the beach serving local fare and fresh seafood. Right nearby, family-friendly Cartoon Network Amazone is an action-packed water park replete with spiraling slides, sprawling pools, splashing fountains, and cartoon-themed rides and characters. Billed as "the magnificence of heaven recreated on Earth," this massive monument, built entirely of wood, is a study in Thai architectural styles. Every available space is intricately decorated with wooden carvings, and the entire structure was built to pay homage to ancient religions and philosophies. The cycle of life, Utopia, and humanity's relationship to the universe are some of the themes reflected in the artwork here. While visiting the sanctuary, you can enjoy Thai cultural shows and Thai boxing, go elephant trekking or horseback riding, or take a ride on a speedboat. As with all of Thailand's impressive wats (temples), Wat Yansangwararam (known as Wat Yan) offers insight not only into Thai design and architectural traditions, but also into the society's values. Surrounded by sprawling palm-studded gardens, the temple was dedicated to King Bhumibol Adulyadej in 1988 to commemorate the 42nd year of his reign. Precious Buddhist relics are housed in the main complex, and on the right-hand side of the path leading to the temple is a lake with impressive Chinese pavilions, filled with antiques and artifacts. Wat Yansangwararam's shrine stands on a hill, reached by a flight of 299 steps lined with Naga snakes. This 18-meter-tall golden statue of the Buddha looking peaceful and relaxed perches atop the wooded Pratamnak Hill south of Pattaya. Climb the steep stairs, adorned on both sides with golden Naga snakes, to see the statue up close and admire the several smaller Buddhas surrounding it. Many locals come here to pray for good health, happiness, and prosperity. You can also enjoy beautiful views over Pattaya and the bay from the top of the hill. If you're not up for a long walk up the hill, you can catch a taxi up and save your energy to climb the stairs to the statues. A 30-minute speed boat ride or 45-minute ferry ride from Pattaya, Koh Larn (also called Koh Lan) is a relatively peaceful escape from tourist-packed Pattaya. Several white-sand beaches stretch along the shores of the island, with food stalls, restroom facilities, and plenty of water sports. Parasailing, banana boat rides, and underwater Sea Walking are some of the most popular. Tien is one of the prettiest beaches, and monkeys frolic on Nual Beach. You can rent motorbikes to tour the island, and it's also possible to stay overnight at one of the many resorts along the beach at Samae and Tawaen. This is a popular place for families to spend the day away from the hubbub of Pattaya. Family-friendly Art in Paradise is an illusion art museum and the perfect place for fun photo ops. Tickle a whale's belly, touch a rhino, or tackle a marlin in life-like artwork and capture the moment in a photograph to share with family and friends later. The different themed zones include classic art, Egypt, the underwater world, safari, dinosaurs, and fantasy. This is a great rainy day attraction, and a fun place to round out your vacation photo collection. Billed as "the biggest and best water park in Thailand," Ramayana Water Park offers an exhilarating day out for travelers of all ages, with 21 different water-themed rides. A riot of colorful, serpentine slides spiral around the park, including a heart-stopping freefall and more gentle slides for the little ones. Other highlights include the double wave pool, a kids' Aquasplash park with fountains, and even a green maze. The lazy river ride snakes through mysterious caves and bubbling geysers. Daily activities add to all the fun and include water polo, fish feeding, Zumba, and volleyball. The first and only floating market in Pattaya, this bustling hive of commerce is divided into different sections selling merchandise from the four major areas of Thailand. Souvenirs, arts and crafts, and clothing are among the many items sold here, and it's also a great place to indulge in some exotic cuisine; you can try everything from scorpions to crickets and crocodile meat. A great way to explore the markets is to rent a boat. Unlike more authentic floating markets, you have to pay for admission here. For a slice of local life and succulent fresh seafood, head to the fish market in the small town of Naklua, about a ten-minute taxi ride north of Pattaya. Vendors sell fresh-caught seafood at bargain prices and barbecue it for you on-site. You can also buy fresh fruit and other locally sourced foods, and several good restaurants are also in the area. A group taxi is the most cost-effective mode of transport, so make some new friends while lounging at the beach and make an outing of it together. A fun way to see the wonders of Thailand and the world, Mini Siam displays models of some of the most famous international sites. Among those on display are Bangkok's Victory Monument and Wat Arun (also known as the Temple of the Dawn), New York's Statue of Liberty, London's Tower Bridge, the Sydney Opera House, and the L'Arc de Triomphe in Paris. Children, especially, will enjoy seeing some of these famous structures all in one place. Bookings should be made at least a day in advance. Underwater World might not be as big as other aquariums, but it's home to an impressive array of sea creatures from different underwater environments. Here, at Thailand's first modern aquarium, you can feed koi fish from bottles, get up close to sharks and rays, feel the texture of sea creatures in the touch pool, and see Thailand's largest collection of jellyfish. Special events for children, like sleepover camps, add to all the fun. Luxury Hotels: Seemingly a world away from the city buzz yet only a 12-minute drive to Walking Street, Royal Wing Suites & Spa is an all-suite hotel presiding over a lush mountainside, with a private beach and beautiful views of the sea. At the Sheraton Pattaya Resort, an eight-minute drive from Walking Street, you can splash in the sprawling palm-fringed swimming pools or bask on a private beach. Steps away from the beach, Pattaya Marriott Resort & Spa, with a well-shaded pool, is only a 10-minute walk from the main downtown strip, and if you want to stay even closer to Walking Street, the Hilton Pattaya is a mere three-minute stroll away. Mid-Range Hotels: Across the road from the beach and within walking distance of shops and restaurants, Holiday Inn Pattaya is a popular mid-range option. If you're looking for light-filled contemporary accommodation, Hotel Baraquda Pattaya - MGallery Collection, with an inviting fish-shaped pool, offers great value within walking distance of the beach and all the downtown action. Far from the madding crowds and featuring stunning sea views, the Royal Cliff Beach Terrace is renovated in contemporary Thai style, with seven sparkling swimming pools and two-bedroom suites for families. Budget Hotels: At a budget-friendly price, Ibis Pattaya, in quieter North Pattaya, lies an easy four-minute walk from the beach but eleven minutes by car to Walking Street, while Chada Thai House lies within walking distance of the city's main street and the beach. If you prefer a quieter family-friendly location away from the hubbub of Pattaya, SeaSide Jomtien Beach offers excellent value.